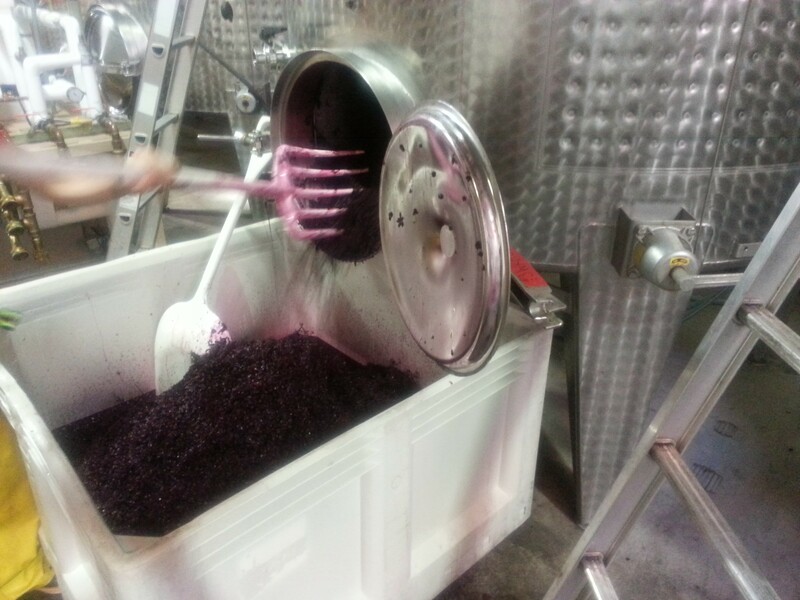 Winemaking is colorful, from the growing season in the vineyard to the pressing in the winery and the pouring in the glasses and the people who make and clean up the messes. 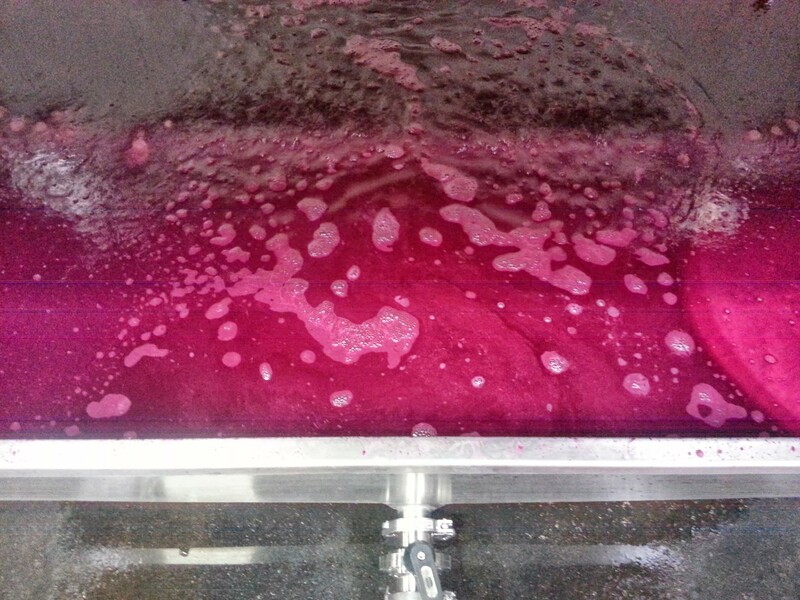 This post, the last for this 2013 harvest, is an ode on the shades of pink that never fail to astonish me. 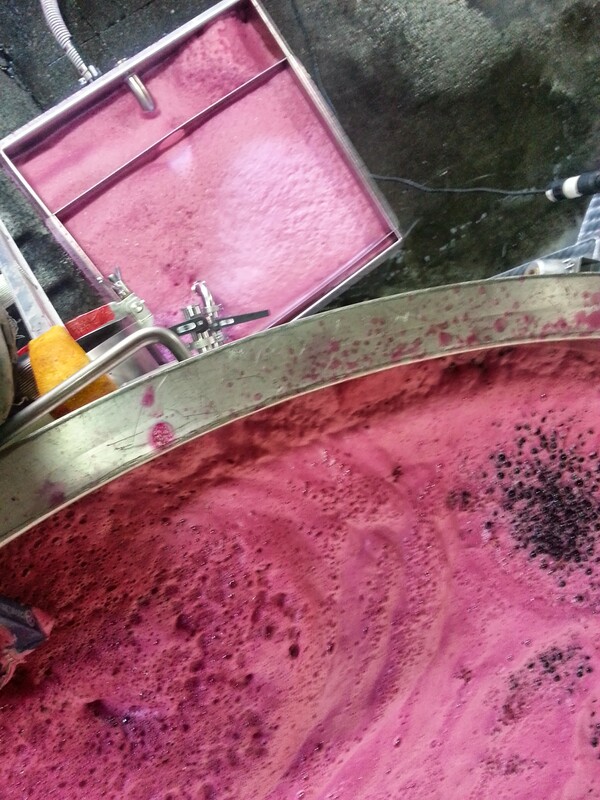 If you spend enough time watching the fermenting juice pour out of a pumpover hose – as you do – you become as sensitive to the evolving colors and the textures and sheen of the foams as you eventually will to the developing flavors and aromas in the ferment and the finished and bottled product. Joe often remarks on how we get to track these fleeting things, there and then gone, sometimes transforming faster than we can even notice them. Something in this reminds me of Lavoisier’s law of conservation of matter: nothing is lost, nothing is created, everything is transformed. It sounds a lot prettier in French: rien ne se perd, rien ne se crée, tout se transforme. With the 31 tons from Walker Vine Hill, we ended up with ten vessels of Walker syrah; fives tanks & five bins, all from different blocks and with different concentrations of stem inclusion, ranging from 0% to 100%. 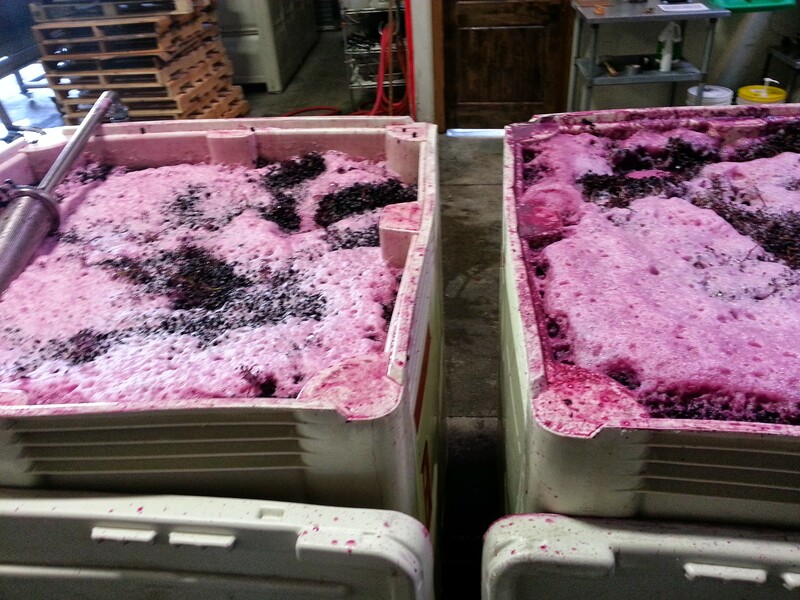 All of these vessels were full to the brim, and these bins, like the tank, made a pretty mess. 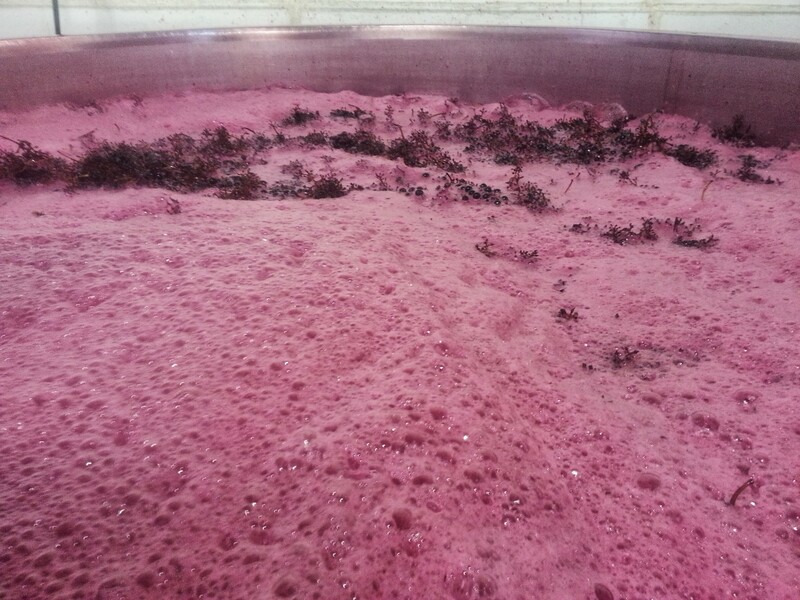 At Donelan, we do both pumpovers and punchdows – each at different points in the course of the fermentation – and sometimes we do a modified “delestage,” a French term for an aerative pumover that involves splashing the juice through a screen and into a sump before pumping it up over the top. It’s designed to help combat any sign of reduction and feed oxygen to the hardworking yeast. After about a week of endless pumpovers from the early days of the Walker ferments came another week of endless punchdowns. 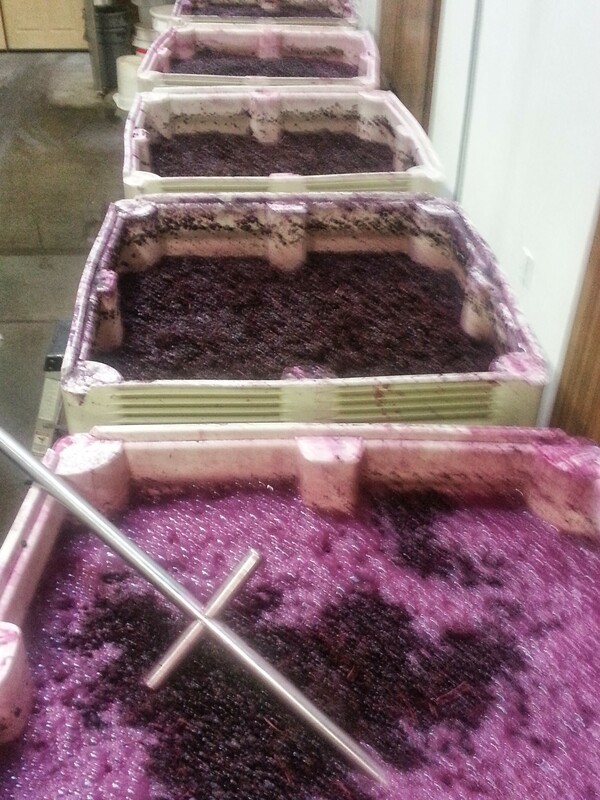 Ten full ferments translates to ten brick walls worth of Syrah to bust through with this steel arm, morning and evening. 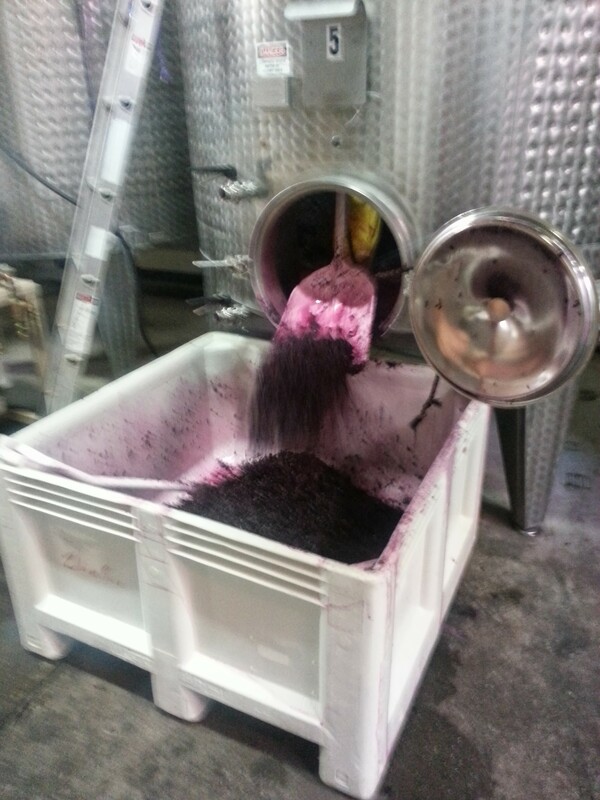 When the tank is dry, we drain the wine to barrel and start the dig from the outside . . . The juice tray during the press cycle. 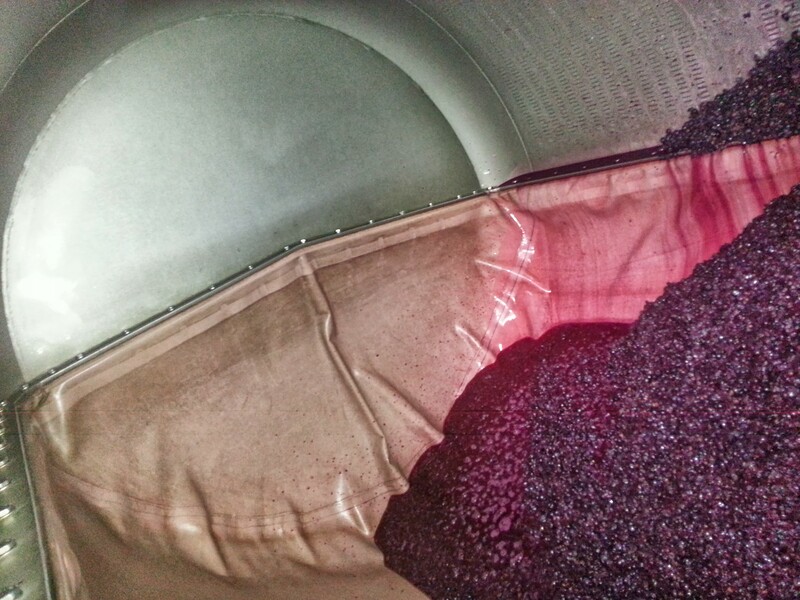 We pump this out and into barrel too. 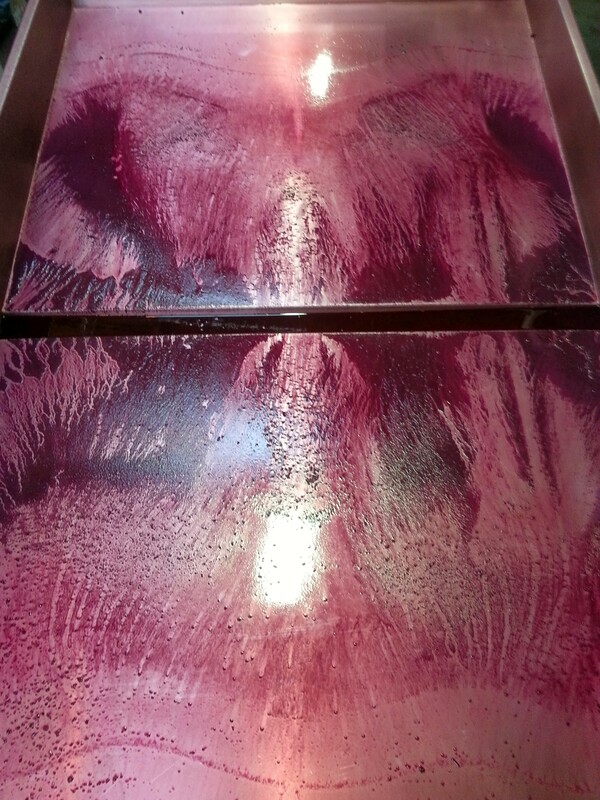 The empty press tray means it’s time to clean the press, which we’ve now done for the last time this harvest. As anyone whose followed this blog (thanks, guy) knows, the photos and the posts get a lot less pink from here on out. The colors and the mess are all contained now, which is the goal, really. The strange beauty becomes different. Nothing is lost, everything is transformed.